We offer a large variety of rubber stamps for all of your needs as a notary. This means you will need a high quality ink pad to get started! We are stocked with a wide variety of colored ink pads in various sizes. In the event that your pad has worn thin in spots from very heavy use, a replacement pad is exactly what you will need to get even longer life out of your notary stamp. If you are a notary that prefers the traditional use of a stamp with a wooden handle, then you will need an ink pad to begin using them. 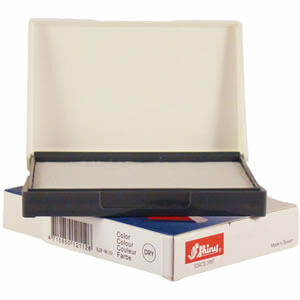 Notary Supplies Online offers ink pads in many different sizes and colors. If you are unsure about the size or if a certain color is acceptable in your state, please contact us before ordering. These superior stamp pads are stock items that can be shipped within 24 hours of ordering. Some states not only require a running journal of all notarial acts performed by the notary public, but they may also require a copy of the client's fingerprint. Simply have your client quickly touch their finger to the ink pad and touch on to your notary journal. This rubber stamp ink pad has ink that can be easily washed or wiped off. Having issues getting excess ink off your fingers or stamp? Simply spray an alcohol-based cleaner on to a paper towel and gently press your stamp or fingers to the paper towel. Never spray alcohol-based cleaners on to the rubber die of your stamp.